In the party horserace, 2011 was the year of not much happening. In fact, it was a year of exceptional boringness on that front, punctuated only by a small and quite possibly transient boost for the Tories after the EU veto in December. But behind that headline of ‘no change’, there were interesting shifts on other fronts. 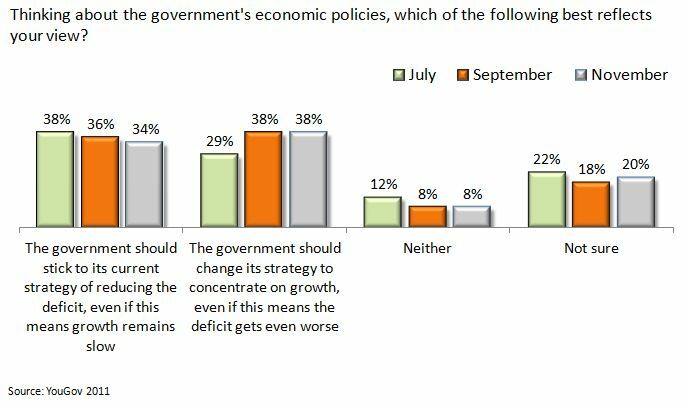 We’ve seen before that there was a significant shift in 2011 towards people thinking that the government should change its deficit reduction strategy to concentrate on growth. 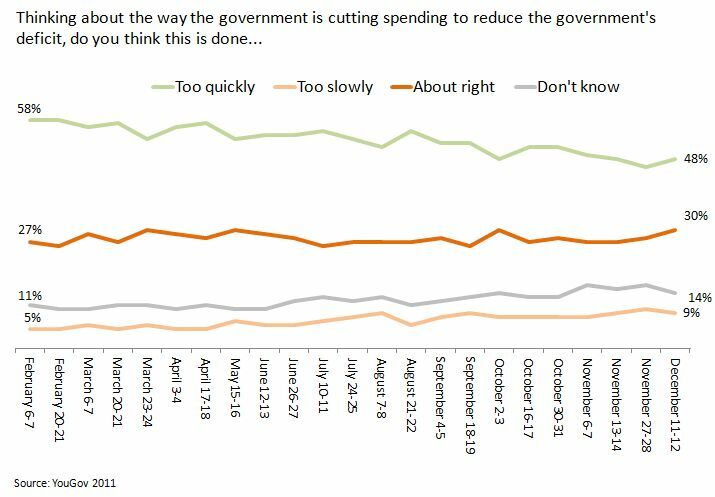 While the first question suggests there is a growing view that more should be done to promote growth, there seems to be less agreement that spending is being cut too quickly. One important trend has moved significantly since the election, but not at all in 2011. This is the question of who is to blame for the spending cuts. In October 2010, Labour were blamed by about 30pts more than the coalition. Throughout 2011, the gap has been consistently around 15pts. 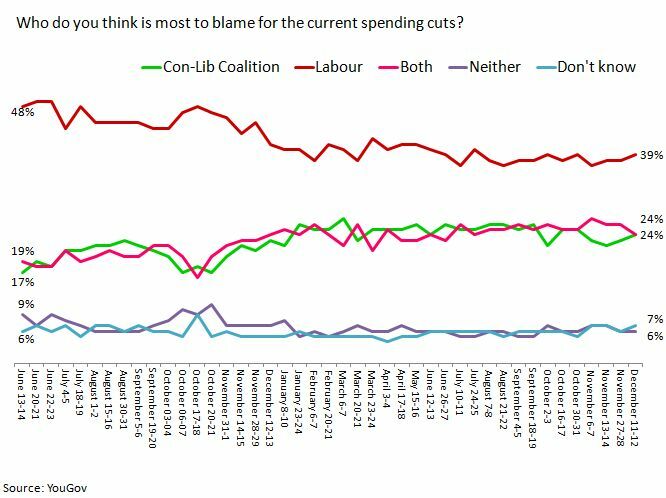 If this moves further, it will become increasingly difficult for the coalition to continue blaming Labour for the cuts. The headline voting intent barely moved in 2011, but there was change in an important indicator of how the parties are viewed. 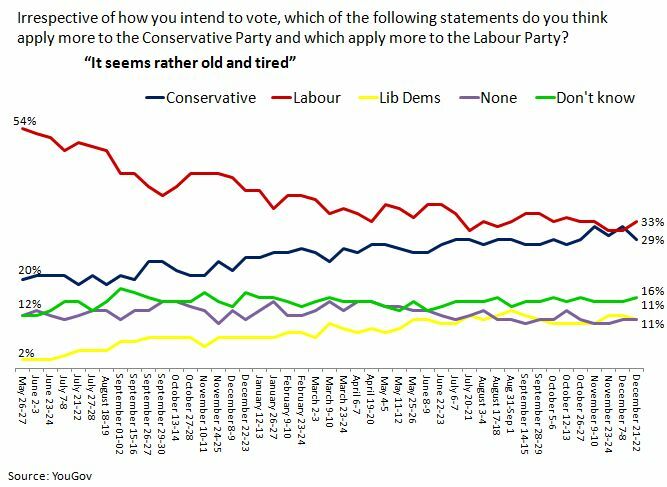 This is the question of which party is most seen as ‘old and tired’. In the first three polls of 2011, Labour were most seen as old and tired, by 13 points more than the Tories. In the last three, that had fallen to 1 point. Were this trend to continue, Labour would soon be seen as the party of fresh ideas, and the Tories the one that’s stuck with exhausted policies. 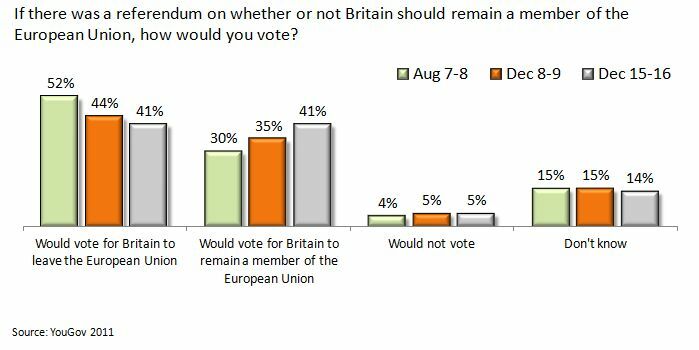 As recently as October, no more than 3 in 10 said they would vote for Britain to stay in the EU. Since then several polls have showed that score creeping up, to the point where the most recent has found equal numbers saying they would vote for Britain to stay in as say they would vote for Britain to leave. My guess is that Cameron’s veto has made the question more realistic. Saying “I would vote for Britain to leave the EU” is no longer such an empty threat as it was a couple of months ago. Whatever the reason, if opinion moves firmly against Britain leaving the EU, there would be interesting consequences for the balance of power within the coalition and within the Tory Party. I’ll return to these five questions periodically in 2012, if only to show the folly of making predictions about public opinion and its impact on politics. This entry was posted on Sunday, January 1st, 2012 at 10:09	and is filed under Politics. You can follow any responses to this entry through the RSS 2.0 feed. Both comments and pings are currently closed.